Read this interesting and factual BitcoinFire.net review and find out why it is imperative that you do not sign up or deposit any of your bitcoins with this so-called service. They are a complete farce. Join us as we delve deeper into the web of lies spun by the brand new cryptocurrency scam BitcoinFire. BitcoinFire.net offers an astounding lifetime profit in the range of 2.04% to 20% daily. Additionally, they offer a registration bonus of 0.01 BTC which they claim will set your bitcoins on fire by generating 2% profit for you each day, a staggering amount of 661.2% Profit in 30 days! This amount is allegedly added automatically to your active deposit balance. Their team has engineered six plans for users to choose from which we will list below. BitcoinFire also offers a 7% referral commission. At the time of publishing this review, BitcoinFire.net had a global rank of 39,081 on Alexa.com, which indicates it’s a very popular website. They seem to be the most popular with citizens of India having an Alexa rank in that country of 10,233. Other countries such as Brazil, United States, Russia and Venezuela respectively, provide them with the most traffic. 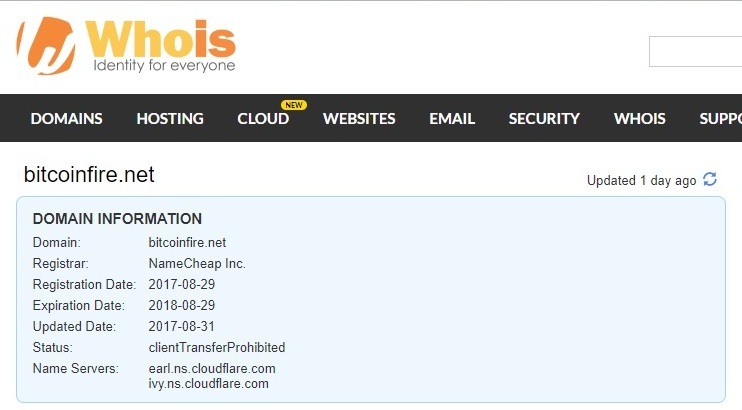 As it stands the website bitcoinfire.net has no domain authority, this is due to being a brand new website. Additionally, no quality external links were found pointing to this site. Their social status turns out to be quite poor as well. They have no presence on Instagram, LinkedIn or Twitter and their Facebook page is quite dismal with only 40 likes (at the time of writing this review). This may be due in part to being so new, however, if this is the case it is hard to believe the stats found on the bottom of their website claiming to have around 59, 021 members when they only launched on the 1st September 2017. How did they accumulate such a large user base then? They also claim to have already received 954, 8745 BTC in deposits and paid out an astonishing amount of 798, 3419 BTC. If you convert that into US Dollars it’s over 3 million. A serious claim for a company who is barely a month old don’t you think? We find this highly unlikely to be honest. There are a number of points one can check a new service against in order to help you determine whether or not it is trustworthy. For example, the age of the website, the amount of profit they offer, real company employees that can be validated, proof of earnings and reputation to name a few. Unfortunate for them, BitcoinFire fails the majority of these points and questions miserably. To begin with, their website is literally brand new. Bitcoinfire.net was registered on the 29th August 2017, making it not even two weeks old at the time of writing this review. Furthermore, the domain was registered privately, meaning we cannot see who owns the website. While some might have completely innocent intentions in choosing to remain anonymous, like not wanting to receive spam for example, it is still a major red flag when dealing with the financial and/or investment industry. People need to know whom they are trusting their hard earned money with. Seeing as how all scam sites and Ponzi schemes take this route, it is no wonder BitcoinFire’s credibility score drops instantly. Another point to consider is the fact that they display no employees, team members, CEOs, founders or even users on their site. There is absolutely no information available whatsoever on who is behind this service, who is working for it or even who has been using it. You might want to sit back and ask yourself whom are you really sending your money to? A credible investment company or someone sitting in a house somewhere, pretending to run a professional service all the while collecting everyone’s bitcoins for the day he or she decides to shut down the site and disappear, much like the recent scam we exposed BitcoinXL.org, who recently went offline and disappeared with everyone’s bitcoins. Most of these Ponzi schemes and scam Bitcoin sites do this. We also find it a bit of a coincidence that BitcoinFire.net appeared online within a few days of BitcoinXL.org going offline and offering an almost identical offer. Both concepts are very similar to each other. Their websites certainly complement each other in terms of layout, content and ideas, and both have corresponding red flags attached to them. This is something you really need to contemplate. Now we come to what is probably the highlight of this BitcoinFire review. Im not sure about you, but if there’s one thing that makes me even more angry than being lied to, is when they think you are stupid enough to actually believe it. BitcoinFire not only openly lies on their website; they blatantly insult your intelligence by thinking that you will never find out the truth. Well, we did find out! On their homepage, BitcoinFire.net states that they are a part of Bitcoin Global Capital LTD. A company based and registered in London under the company registration number 09930781. We do not just believe everything we read, so we decided to do a little bit of digging. We went onto Bitcoin Global Capital’s website and could find no mention anywhere of BitcoinFire being a part of them. This immediately raised suspicions, so we took it further by contacting Bitcoin Global Capital via email and asking them whether BitcoinFire is indeed a part of their company. Their reply, as you will see in the screenshot below was a definite no! Not only did Mary Gibson, the UK Office administrator, state that they were in no way affiliated to BitcoinFire, she also said that they would be seeking legal advice regarding their erroneous claims. In light of this, we quickly returned to BitcoinFire.net & took a screenshot of their homepage (as seen above), just in case they decide to remove it once they receive a legal notification or if they decide to deny ever having stated this on their site. This now obvious lie was the ultimate showstopper for us regarding the legitimacy of BitcoinFire. A person would have to be completely insane to still trust this service after discovering that they lied about being a part of a bigger company. Their reasoning for doing so was likely to gain the trust of new investors by fooling them into thinking they were a part of something much bigger. After having busted them blatantly lying on their site, coupled with many other red flags we found while looking into this horrendous service, we are left with no choice other than to blacklist this scam Bitcoin service and warn as many other people as we can before they fall victim to BitcoinFire. Remember, just because a site is deemed as “paying” their customers, does not make them trustworthy. Especially in this industry. Many other sites such as HashOcean also paid out for a while, but ultimately they too shut down and disappeared along with their members investments. Do not be fooled by people posting “proof of payment,” these are generally from affiliate marketers looking to make commission and have often been edited or photoshopped. 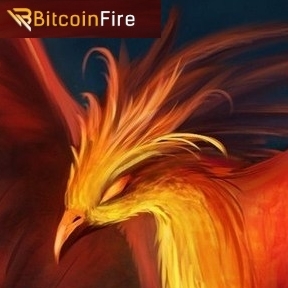 Review Verdict: Bitcoin Fire is a scam! Have you been scammed by BitcoinFire? Share your experience and feedback by commenting below! I made payment last night, now I am at dead end to withdrawal my bargain. Something needs to be done about all these scammers that dwells on someone sweat. sorry i meant the site won’t load. Guys got scammed for 0.02 btc. Now the site loads. Scam alert. i did the .001 min deposit, and within two hours after my deposit confirmed i could withdraw .0016, then the next day i withdrew .00064, then yesterday i witthdrew .00038, then today the site wont load, so i was just hoping it was to many people on it or some other simple error, but you guys are bursting my bouble, im glad i was able to recover my btc so fast before they went down, but looks like that profit was short lived, but i did make a couple bucks at least, literally about 2 bucks but could have been much worse. what do you guy know of bithaul.net, ive been using these guys for a few days now, ive been able to withdraw twice now, payment was instant just like bitcoinfire, but there site still loads, and they dont have as good a deal but they payout forever or untill they go under, and they have same min deposit, ill let ya know how i make out, but so far so good. Will review them for you. Luckily I was only scammed 0.01 BTC… still livid as hell though. I wish you would have written this a few hours ago. Cause the only reviews I found was a few fraud reports that said that they were cautious but a trusted site. So I sent them .007 bit coins and now I cant access my account which I have been waiting for the deposit to post. Its as if I was black listed. when I clear my cookies or use torrent I can access them but to actually use my IPE address I am black listed. As I am sure others are starting to find out. This is one of many that say they deal with the UK. I wish the Uk would take another person serious. Could you give me your contacts in UK? Maybe they can help me shut down a scammer since the cops wont do crap about it. You could check the guy out for yourself (bitminer.io, startminer.com, btcminer.me, ethminer.io, ltcminer.io) the guy says give him bitcoin and you get a good return for a lifetime. what he doesn’t say is that you only get a one time withdrawal. First time for signing up is a free on unless you pay off the bat. next if you pay .01 bit you can withdrawal .005 bit max and supposedly you when you get to the last one there is no cap. but with no contracts, and no one whos gotten there. no one knows. Oh and you cant roll over mined coins into the next contract. you have to pay from your own coins that you have available. i have invested 0.002 in bitcoinfire and after 8days i have roi. Since I saw the gains I assumed it was a scam, but I had some satoshis, so I made the deposit by the “Low” 0.001BTC plan, at 5 days I already had in profits more than 0.001BTC, I made the claim for they, in something more than 2 hours, already had in my portfolio of Blockchain my payment. As I received my payment so fast, I wanted to try using another account. Try to open another account with my referral code and deposit the 0.001BTC that in principle had been returned after 1 days of realized then the page does not exist. (I.e. I lost 100,000 satoshis for not reading this post before. :-), although I was always exceptional, the profits were too many to be true. Ive received 2 payouts from them so far. I will come back and let you know if that changes but they haven’t scammed me yet.